It's not the scripted part, we've all come to realize they purposely inject drama into these shows... American Chopper was probably the first and worst... "OMG, we've got to get this bike to paint and the show is in one day!" I love the scenery and am interested in the local people and stores etc, the Bush family however is beyond scripted, they're phony and scammers. What's your point? A lot of things are bad for you and yet people still do them. Alaskan Bush People. Show apparently taken off-air. It was probably pulled off the air quickly and quietly because it had been such a deception for people that they wanted to donate money, etc to this family. That kind of deception can't be legal. How is it any different from the spam Nigerian "hard case" emails you get in your inbox? Their website, which is owned by Joshua (Bam- Bam) Brown: AlaskanBushPeople.com WHOIS, DNS, & Domain Info - DomainTools is ONE MONTH AND TWO WEEKS OLD: Alaskanbushpeople : The Official Alaskan Wilderness Brown Family - Home On the website they talk about their home and their pets and all of the kids' bedrooms and all that. All of that is CURRENT in the LAST SIX WEEKS!! The Brown family - The Official Alaskan Wilderness Brown Family Whois shows the website was CREATED on 4-09-2014. The information about the family is CURRENT. They have a home and PLENTY of money. Their "mirror site" AlaskanWildernessFamily.com WHOIS, DNS, & Domain Info - DomainTools has pretty much the same information; except that it was created last November. The other site was created the first part of April of this year. I just saw the latest episode... Where the boat sank in the harbor. And the youngest had to see a dentist. I did read the web-site that shows a house and rooms for each kid after the first episode- which is when I knew it was more staged and dramatized than anything else. I did find it fascinating that they were catching salmon by hand in the stream. Not that I don't believe any one could do it, I have just never seen someone catch fish that way before. I don't see why you would consider that so unusual since bears have been fishing that way in Alaska for a long time. Probably they saw a bear doing it that way and copied their technique. I remember seeing Salmon in a stream on the Northeast part of Kodiak City where I think you could have walked across on their backs and not got your feet wet. I didn't try it because there were several bears eating Salmon on the bank of the river nearby. Seven grandsons from the Seattle area have been taking turns spending summers with me since they were 5, they're all grown now and it sure gets quiet around here in the summer. Their favorite funtime was when the humpies are running up the creek near me....yup, they'd jump in and catch them by hand and bring them home for me to can up for dog food. ps: about that stupid show, those were old wore out icky humpies nobody would eat, not cleaned, not iced and by the way, the salt chuck they went through was into Barnes Lake which is on Prince of Whales island near where Davey Jamison lives in his floathouse, not near Ketchikan. and humpies run in July. Insane Duane did not die from a brown recluse spider bite---where'd they come up with that one, it's hilarious. I knew the guy for decades, he finally managed to drink himself to death. I know I've seen that main character loser somewhere in the past, probably the ferry or in a bar. Dave hasn't been called 'animal' for about 20 years, this guy must have known him in the past and decided he'd be a good addition to the story. Nobody drags their sunk boat into the harbor then digs thru the junk. They beach it. If the city of Ketchikan had to clean up that mess, no wonder the show's ended. What a farce, but hey..it's been entertaining. There ya go; this is real bush living in southeast. If I thought my kids wouldn't shoot me, I'd post their fishing pictures from up and down Chatham Straight and in the various bays, XtraTufs and beach soup - rocks, limpets, seaweed and a little "green slime" added for good measure. 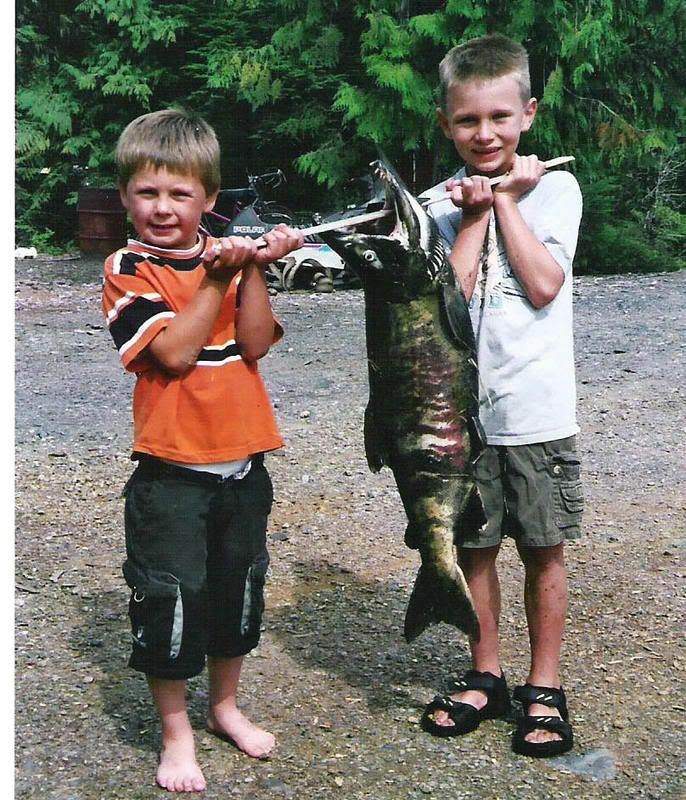 The kids wake us up at 11 p.m. to show off the dolly they caught - and can we take a picture? Sure, I'll wake you up at 4 a.m. to get it. Shoveling snow, packing firewood, cutting meat and fish. That's the life, not the hard-scrabble BS shown on television. Humorous is one thing, these shows are another, but let it go and be glad they aren't your neighbors. Thanks for clearing up the BS. Not that I believed any of it anyways. One of my first thoughts was why are the fish not iced - but then I figured, maybe it was not hot out. Fish begin to go bad and smell fast down here if they are not iced (or kept alive) immediately after being caught. I also looked up brown recluse spiders and noticed that they are not typically found in AK. That happens to be one of very few poisonous spiders in Florida.